Another eventful year is drawing to a close. 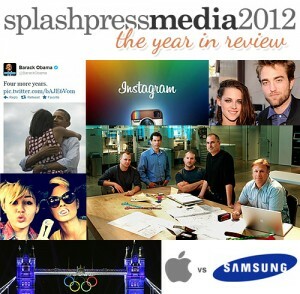 A look back at some of the biggest stories and the winners and losers, the joy and the tears, the highs and the lows of 2012 all covered across the Splashpress Media network. Barack Obama won a second term in office and shared a celebratory image of him and Michelle hugging. The image became a huge hit as the most liked image on Facebook to date along with the highest amount of re-tweets. Celebrities around the world also celebrated his victory with images of support across Instagram, Twitter and Facebook. In April Robin Parish, editor of The Apple Gazette put together a fantastic set of unseen images from inside Apple’s secretive HQ or the ‘Mothership’ as its referred to by Apple fans. Robin has been busy updating the post with any new images he has gleaned over the year and it now boasts a whopping 156 shots! Instagram has accelerated faster than anyone could have expected and was snapped up by Facebook for a measly one billion USD, Infographiclabs took a look at its path from the early beginnings only 2 years ago in 2010. Instagram was the biggest hits of the year for the tech industry and during the summer Olympics held in London it proved it self to be the main platform for capturing and sharing images from the events with over 64,000 images taken in total. In the case of ‘did they or didnt they copy Apple’ the jury final ruled that Samsung had infringed copyright laws. Samsung were then forced to payout $1 billion dollars to their rivals with Samsung issuing a statement that it was “a loss for the American consumer” and Google certainly sitting up and taking note. In July Twilight star Kristen Stewart was caught by US Weekly cuddling and being intimate with Rupert Sanders the director of the movie she was starring in ‘Snow White and the Huntsman’. Twilight fans couldn’t believe it with many of them losing it on YouTube (for a change). RPatz was humiliated and soon moved out of their home only to take KStew back conveniently in time for the release of their latest Breaking Dawn movie. Wishing everyone a Happy New Year from everyone at Splashpress Media!